My husband’s second favorite restaurant in the world is The Cheesecake Factory. We don’t go for the food, we go for the cheesecake. All of them. Okay, well maybe not all of them, unless we’re in a large group, but we always order at least 4 different cheesecakes to share between us. Two bites out of each and the rest gets packed up for home to enjoy later. Unless I’m in the front seat of the car with a plastic fork in hand and the to-go boxes on my lap. Then we’re in trouble….big trouble. Especially if one of those cheesecakes is a chocolatey, caramel-y, nutty turtle. 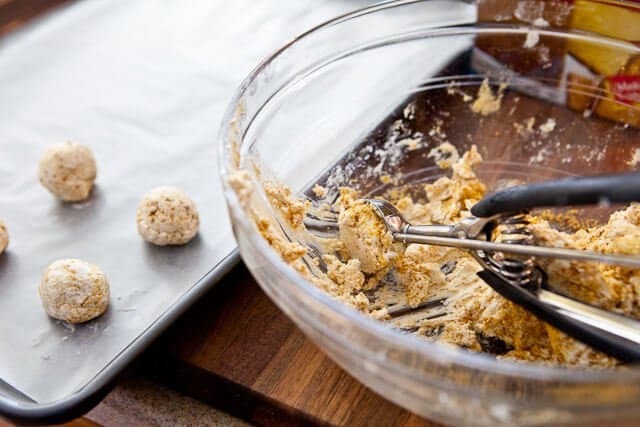 At home, instead of making an entire Turtle cheesecake — because we all know what will happen if I’m alone with cheesecake – I make little cheesecake balls, bites and pops. Each one of these is about 3-bites big, and they are designed for SHARING, as in take-one-pass-it-along. Promise me, no hoarding. 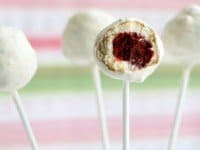 Bites, balls, pops and turtles are the only types of desserts I’ll let myself make. Portion control is not my strong point. 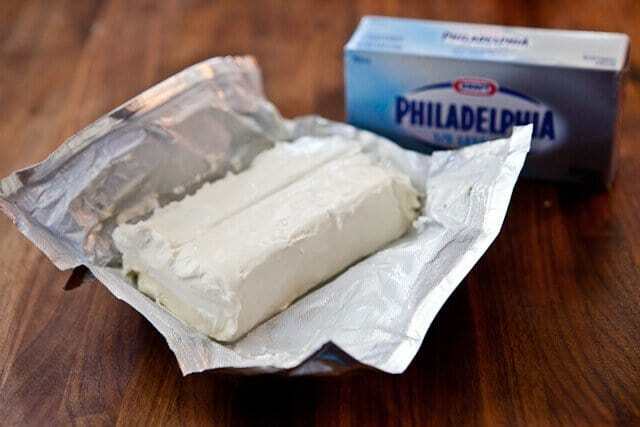 It all starts with Philadelphia Cream Cheese, I use the 1/3 Less Fat version. Make sure it’s softened to room temp. Mix in graham cracker crumbs – the come in a box and are pre-crumbed. Or you could take the crackers and pulse in your food processor. Use a melon baller to create evenly sized balls. Freeze for 10-15 minutes to harden. 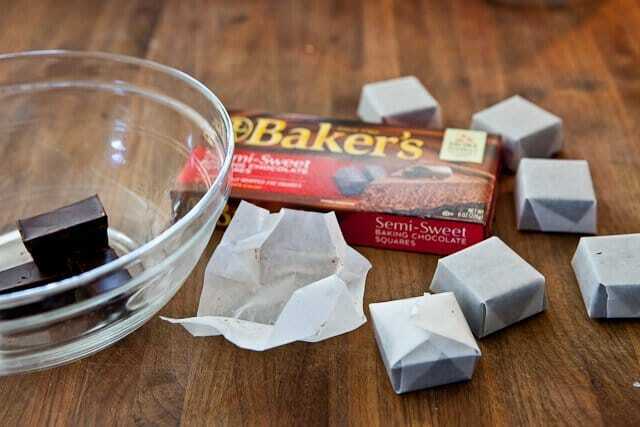 While the cheesecake balls are freezing, melt the chocolate squares. 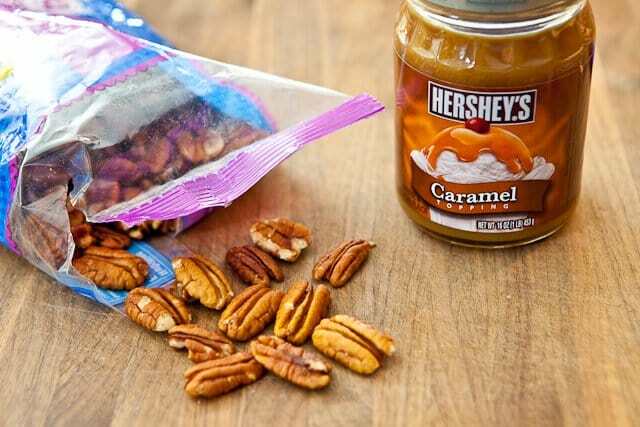 You can use candy melts as well. Want to win $25,000? 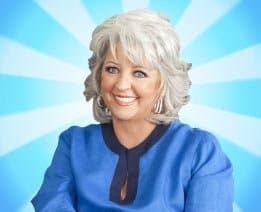 Paula Deen and Philadelphia Cream Cheese are looking for the next big cooking stars, and this season of Real Women of Philadelphia is going to be bigger and better than ever! Join the Real Women of Philadelphia Community and check out details on how you can enter to win $25,000 or become a cooking star. 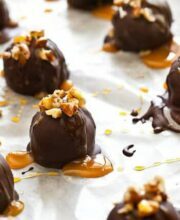 See more recipes from BlogHer’s campaign on roundup page. 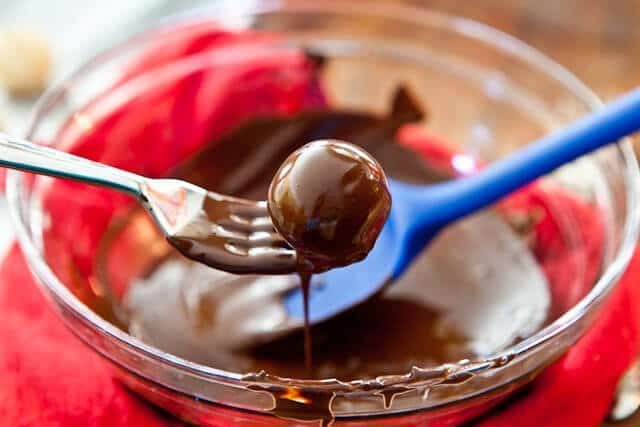 Until the chocolate is fully melted and smooth. 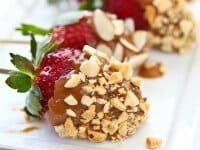 For the rest of the topping, I use pecans and caramel sauce – the kind you buy to pour over ice cream sundaes. You’ll use a fork to dip the cheesecake balls into the melted chocolate. 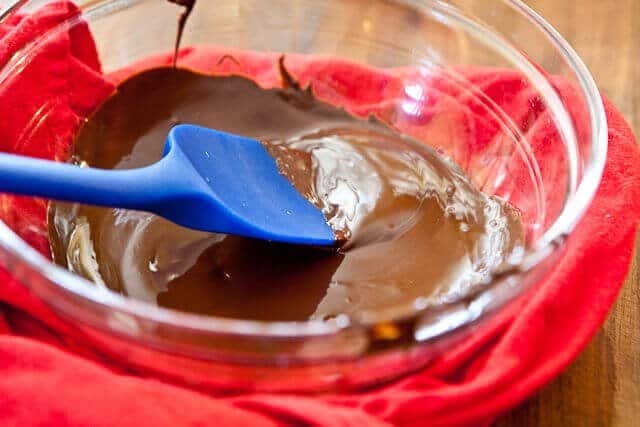 Let the excess chocolate drip through the tines of the fork. 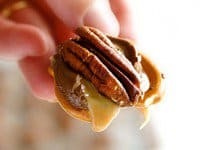 Top with a few pecan pieces. 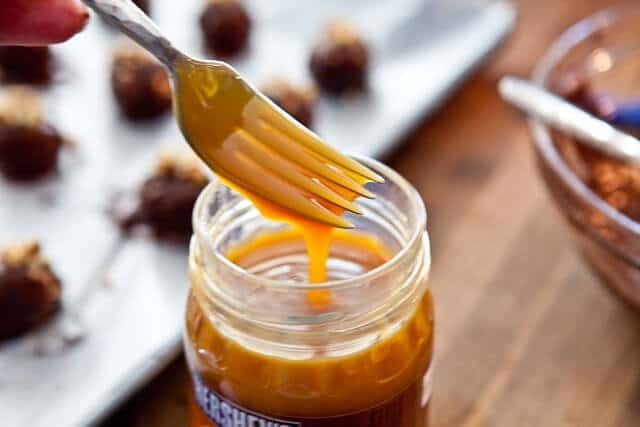 Dip your fork into the caramel. 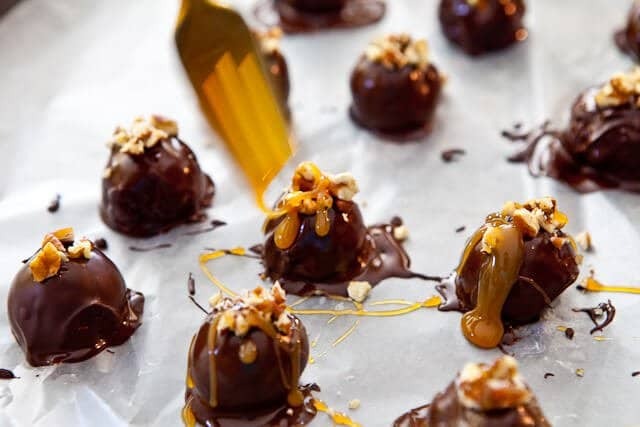 And drizzle the caramel over the cheesecake truffles. Then sit back, kick your feet up and enjoy just one (you’re supposed to share the rest). 1. 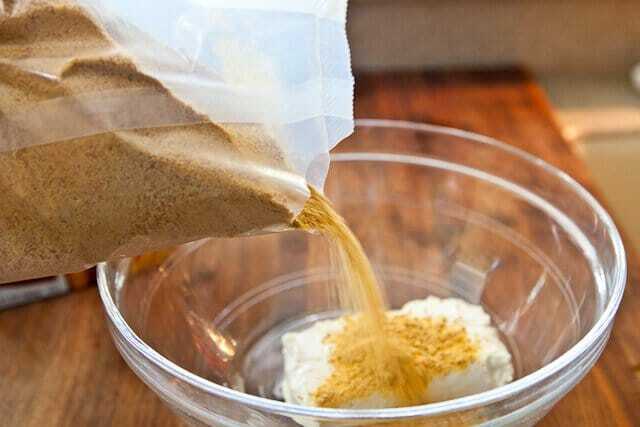 Combine the cream cheese with the graham cracker crumbs. Use a melon baller to scoop up 1 1/4" sized balls to a wax-paper lined baking sheet. Repeat until you've scooped up all of the cream cheese. You should have about 15 balls. Freeze for 10-15 minutes. 2. 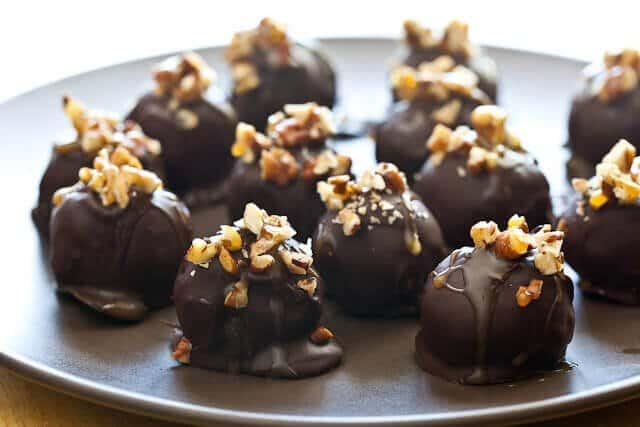 While the cheesecake balls are freezing, melt the chocolate according to package directions. 3. Using 1 or 2 forks, dip each cheesecake ball into the melted chocolate. Let the excess chocolate drip away between the tines. 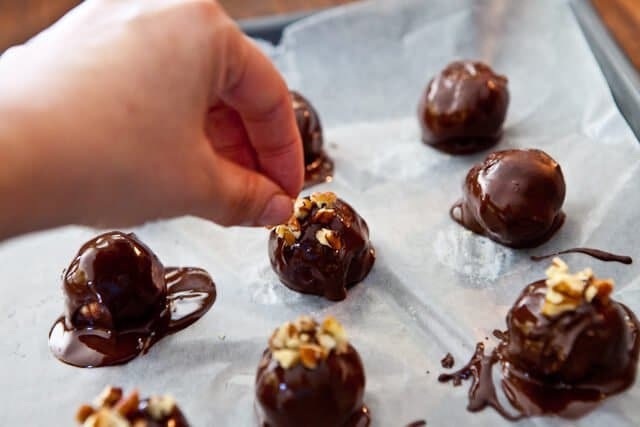 Place the chocolate covered balls back on the wax paper on the baking sheet. Repeat for all cheesecake balls. 4. 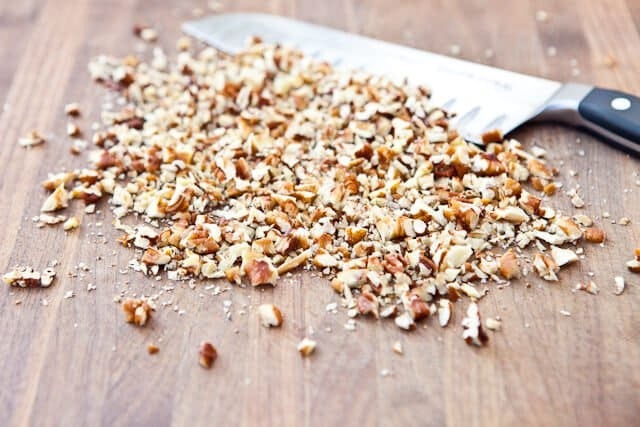 Top each truffle with pecans. 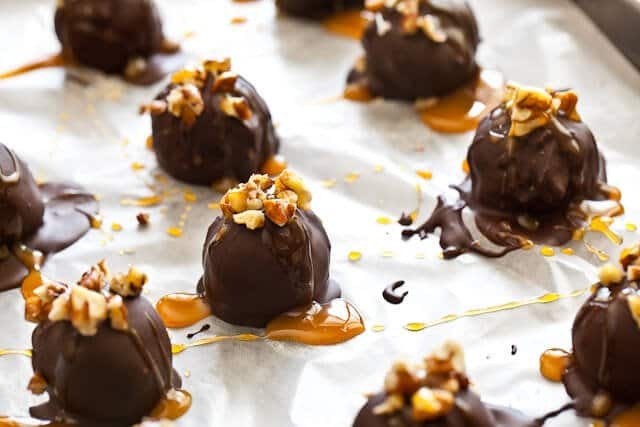 Drizzle caramel over each truffle. Refrigerate at least 1 hour before serving (up to overnight).